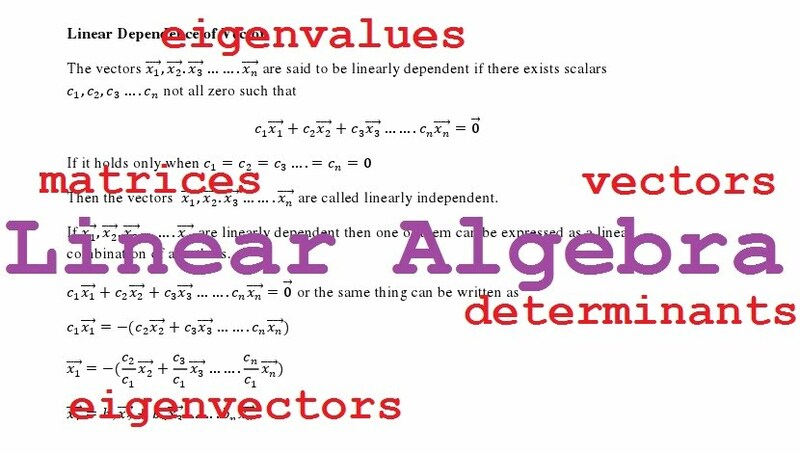 Demonstrating the Crammer rule, using eigenvalue methods to solve vector space problems, verifying Cayley Hamilton Theorem, advanced problems related to systems of equations. Solving a system of differential equations . 1. Solving a system of linear equations using augmented matrix method and using echelon forms. 2. Finding the condition for a system of linear equations to be consistent. 3. Testing a system of linear equations for consistency. 5. Handling a system which does not have a unique solution. 6. Finding the characteristic equation of a matrix. 9. Computing the eigen-values and eigen-vectors of 2x2 and 3x3 matrices. 11. Verifying Caley Hamilton theorem for a matrix; finding inverse of a matrix. 12. Using the eigen-value method to get a formula for the n-th power of a matrix A.